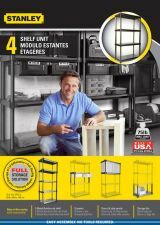 Stanley emailed out a survey today with questions regarding a possible new modular shelving system. From what I gathered from the survey, people can simply buy one of their 4-shelf (plastic) or 5-shelf (metal reinforced plastic) units from the system and use it alone, or combine it with the modular add-ons. The add-ons include Drawers, Doors and side panels that form a cabinet, and Storage bins. The system does not require tools to assemble, which makes the modular design even better. I am happy to see a Made In USA logo on the packaging, but these haven't hit stores yet, so we will have to wait and see if this is true. There was no hint as to what the pricing would be, or when we can expect to see these. Side note: Anyone else notice what looks to be a Makita case on the bottom shelf?